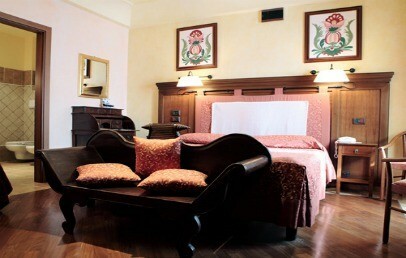 The sweet hills of Castelbuono, medieval city in Palermo province, host the elegant and exclusive Relais Santa Anastasia. 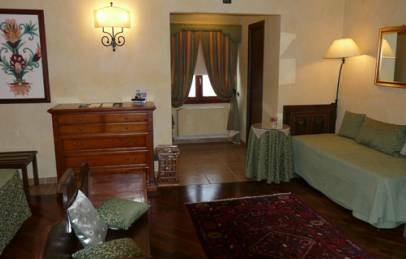 The Relais is close to the renowned tourist centre of Cefalù. 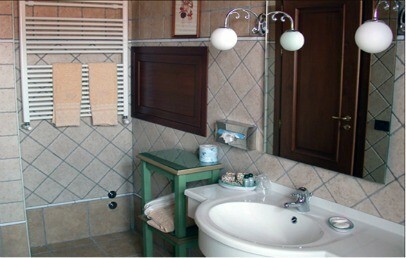 It is just 100 km far from Palermo and 200 km from Catania, easily reachable through the motorway in less than one hour. 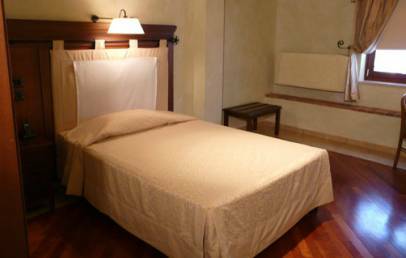 The Relais Santa Anastasia, result of the renovation of a medieval Benedictine abbey of the XII century, is a luxury residence with an ancient atmosphere. Restored with care, paying attention to every single detail, the Relais receives its guests among valuable furniture in the refined serenity of this fascinating historical building surrounded by the evocative panorama of the Parco delle Madonie. The Relais Santa Anastasia has 29 accommodations of different categories: 2 Singles, 19 Classic, 4 Deluxe, 2 Junior Suite and 2 Grand Suites. 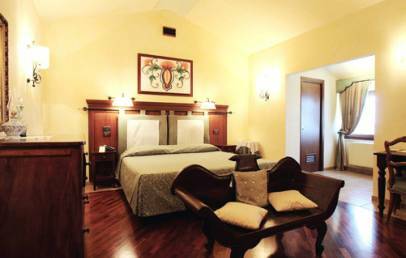 All the rooms are named after a grape variety to underline the strong bond with the wine culture. They are furnished in a refined, elegant way and offer modern technology well combined with the room’s style. Wood and cloth give a sense of warmth and intimacy. The restaurant “La Corte dell’Abate” receives its guests in a very elegant atmosphere; it is usually used for dinner and on certain occasions for events, like wedding banquets. It proposes delicious traditional local dishes of local and regional cuisine. Breakfast and lunch are served at the restaurant “Passioni e Tentazioni”, in a fresh and informal atmosphere; situated near the swimming pool. The Winery Abbazia Santa Anastasia is just close to the Relais; the chance is unique to visit this eno-agricultural establishment not only because of its ancient history, but also for its particular biodynamic approach in winemaking. It dedicates itself to the land with energy and love, reflecting this passion in the high quality of its wine. An outdoor swimming pool with Jacuzzi corner to regenerate body and mind, the large equipped sun terrace offering breathtaking views as far as to the Mediterranean Sea and the Aeolian Islands, the reading room “Adelasia” as well as the fireplace room “Focolare di Ruggero” are all conceived to offer moments of peace and relax. 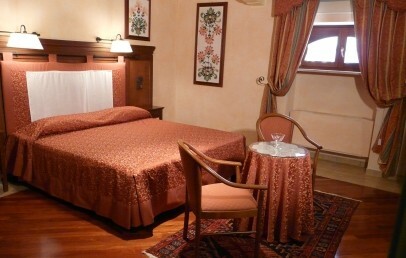 Single room on the first floor, furnished with a great care for the details in a antique style with a fascinating and cozy atmosphere given by the colours and precious textiles. The bathroom has a shower and hairdryer. Classic rooms offer a lovely view over the roof of the Relais. 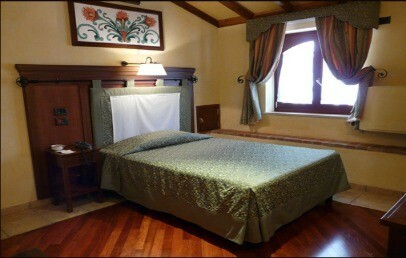 Double room located on the top floor of the Relais. Furnished with a great care for the details in a antique style with a fascinating and cozy atmosphere given by the precious textiles and curtains. The bathroom has a shower, hairdryer and courtesy set. 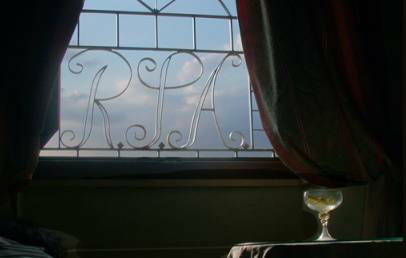 The Classic rooms have a minibar, a safe, a radio and offer a lovely view over the gardens. The double rooms Deluxe are located on the floor level of the pool with sun terrace and the palm tree garden. 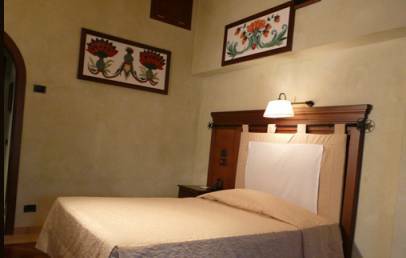 They are furnished with a great care for the details in a antique style with a fascinating and cozy atmosphere given by the precious textiles and curtains. The bathroom has a tub, bathrobes, hairdryer and courtesy set. 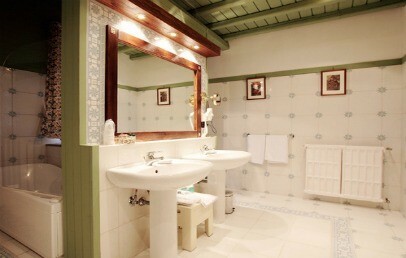 The Deluxe rooms offer a nice view on the pool or on the garden and have a minibar, safe and radio. Spacious and elegant accommodations. One Junior Suite is decorated in the colours of yellow and green and located in front of the pool and offers a nice garden and hill view. 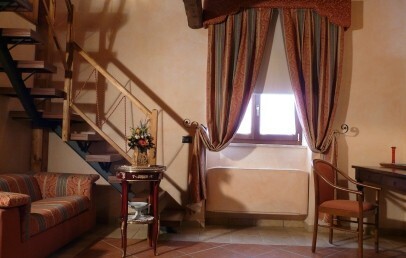 The other Junior Suite is located on the inside of the Relais and furnished in an antique style with the colour red and offers a lovely view on the front court of the Relais and on the little church. Both Junior Suites have a living room and a bathroom with shower or tub, hairdryer, bathrobes, courtesy set and a minibar, safe and radio. 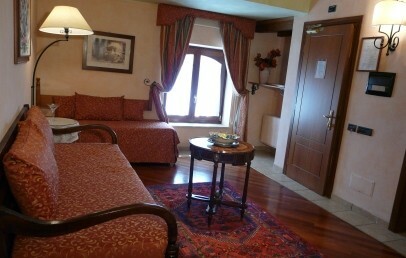 Elegant and cozy Suite furnished with a particular care and with colourful and precious curtains. 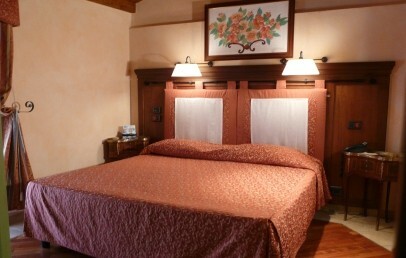 The Grand Suite has two separate rooms with desk and relax area. 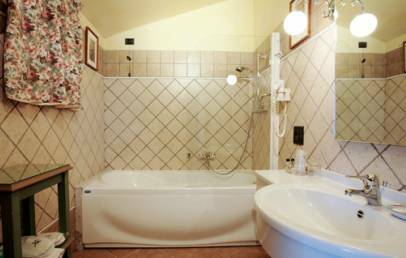 The Grand Suite has two bathrooms with shower or tub, hairdryer, bathrobes, courtesy set and a minibar, a safe and a radio. The view is on the garden and on the countryside.